As the doctors fought to arrest the cancer spreading through my body, hundreds and hundreds of messages of love were reaching me from across the world. Christians, Muslims, Jews, Hindus, Buddhists and others sent messages of encouragement. Messages from Masai herdsmen, Zambian game scouts, Shangaans at Londolozi, singers, actors, scientists, conservationists, businessmen and women reached me. I can assure you that every message that reached me, made a difference. Thank you! In those messages were frequent references to God. Clearly religion is a powerful force across the planet. I have never followed a religion and know nothing about it. My only connection to religion was that my forefathers were missionaries preaching the word of God across Africa and Tina Turner who introduced me to Buddhism. Every day I get up, go into the bush (which is my church) and search for a striped cat. When I find the cat, I marvel at the beauty and wonder how we could have pushed such a beautiful creature to the brink of extinction. Everyday I am inspired to be in the presence of the Tiger. In short, the Tiger is my God! I’m the first to admit that what I’m doing has very little significance in the Greater Purpose. However, as Gandhi said "even if you do not achieve, it is important to try". What puzzles me, is why the religious leaders of the world, who are obviously so powerful, are not more concerned for the planet and its future. Whilst the Pope concerns himself with whether his followers should or should not use a condom or should or should not practice birth control, the human species is moving towards 10 billion. That species consumes 80% of the world’s resources. What the religions of the world can't get away from, is they all breathe the same air. If humans continue to remove the forests of the earth, we will subject the planet to lung cancer, which will drastically affect all of us. If the polar ice caps continue to melt, it will affect all the people and religions of the world. There is another God who is not concerned whether you are Russian or American, Christian or Muslim. Her name is Goddess Gaia, the Greek Goddess of the Earth. Gaia has been around a long time. She has been hot and she has been cold. She has seen species rise, fall and become extinct. As long as the Sun gives her heat, she can support life on Earth. Goddess Gaia is not concerned with the fall of the dinosaurs or the demise of the tiger. Gaia concerns herself with the health and future of the planet. Any species which disrupts her ability to protect herself, will be reduced or eliminated. Gaia deals in cause and effect. Actions have consequences and she is the sole judge and adjudicator. If a species partnerships with her, she rewards them richly. If a species sabotages her, it is dealt with accordingly. In January of 2011 Gaia flooded Tiger Canyons and destroyed in a few hours what had taken me 10 years to build up. She did it before and she will do it again. Right now Gaia is scorching the grass on the sheep farms across the Karoo and drying out the water table. Gaia gave us 100 million springbuck and we swapped that for 20 million sheep. Does Gaia care if 5 million sheep die and 5 000 sheep farmers go bankrupt? Not at all! South Africans complain about load shedding, Gaia can switch off the entire power supply of South Africa permanently with one stroke of her ecological armoury. Consider what Gaia has at her disposal. Heat, cold, wind, rain, snow, fire, cyclones, hurricanes, tsunamis, drought and disease etc. If I was a political or religious leader, I would be standing in the queue to get into her good books. I would be plotting and planning how I could partnership with her to ensure the future of my country, my followers and my religions. In short, I would be making friends with Gaia. Nowhere on planet Earth do I see the political or religious leadership that is working to ensure the future of the planet and the human species. 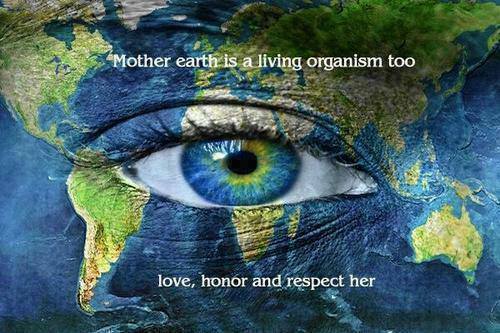 Respect Mother Earth, Father Moon and sky and the earth will live abundantly. Don't, and you'll see the cause and affect of poor debilitating judgment. May Archangel Ariel give mercy and grace to your illness. You have much still to do my friend. Your work is not yet done. May Ariel abound healing and protection over you always. Archangel Metatron offer your shield of protection to John. I thank you always in service of our tigers. I wish you all the best! Your good works will not go unseen. Johnny, I, like you, am not a “religious” person. I have never had a religious home - anywhere….ever - Christian, Hindu, Islam, Shintu, Buddhist, or anything else for that matter - none have ever really appealed to me. I have almost admired the capacity believers have to subordinate themselves so entirely to their particular spiritual belief. I have also never heard of Goddess Gaia - until now! Your email provides a name…..Gaia….without ever knowing the name, Gaia (Mother Nature as you describe her), has actually been my sub conscious God all of my life. I wish you well with your health John. I have followed every word of yours on facebook and I respect and admire the way you have dealt with dire adversity through humour and pragmatism. No doubt Gaia has had a hand in that too! All the best to you in good health and may Goddess Gaia continue to look over you. Wahoo! Just looked on Facebook and got the terrific news from your docs! SO very relieved and pleased. Say hi to Tibo and all of the family for us. That was a brilliant video. My breath was knocked out of me when I read this email. I had no idea you had cancer. when did you get this diagnosis? I am so upset. I care so much about what you, the tigers and your efforts. Please, you or Sunette do let me know how you are. I visited in 2012 and although I was alone with you you did not mention the flood in 2011. I know your mind is filled with other things. Please drop me a line. Like you I have no allegiance to a proscribed religian but I do believe in spirit. I really hope that the cancer has been knocked for 6 and does not come back. I had a really excellent day with you and I got a lot of good photos, I just wish that their were more people passionate about conservation of animal and plants etc. You certainly saved me a trip to India but I would also like to see tigers and also the building etc but the domestic arrangement have a lot to say for themselves etc well it would be India!! Just received this email. JV, do you have cancer? We are praying hard that this is NOT so. We are in shock and very, very upset. We are praying very hard to our and any other God we can find to heal you if indeed you are ill.
Our ongoing concern deepens every day, as the genetically mutated hominid greedily goes about destroying this beautiful intricately balanced planet. My fear is that awareness will only waken when the natural resource structure collapses completely - "So many with no idea as to what they do" ! Nature as with you is my religion, the bush my garden - often harsh and unforgiving, amazing and very special. (No corruption, money making, deceit or disrespect). You have always faced adversity with intense passion, intelligence and strength and our thoughts are with you. It is with great sadness that I learnt of your cancer in your latest news letter. I'm also a non believer and have in fact no respect for religions. I value and treasure nature. Your contribution to the betterment of nature is legendary. I hope you have the strength and support to deal with this sickness. You are in our thoughts. Thank you for the precious gifts, the books about Tiger Canyon and Londolozi, where it all began, following your meeting with Pete Cummings. Your gesture is as appreciated as it was unexpected. Then I learned of your predicament on the same day I received the books. I could not help wondering about the irony and coincidence of it all, and the fragility of life that comes palpably through the pages in your books. Then I read your note on Goddess Gaia, and found reassurance that your fighting spirit is alive. So, all considered, I choose to hold on to that. hey guys i really appreciate the work you guys are doing to save tigers from being vanishing and interacting different big cats like cheetah ,tiger ,lion , leopard etc and making the habitat just like before , i really appreciate your work towards saving tigers . Jesus Christ has been given ultimate power over everything created including Gaia. Therefore it would be wise for All Politicians to stand in the queue to please him. abble to do that and she is you! You're 100 % right : always try. Every little thing is important. Nothing is lost, all is transformed, turned in something else. Terribly sorry to hear that such a HUGE presence as yourself is undergoing that furtive little sneaky disease. I trust that you are healing to continue your good work. Best regards from all at Impi wire in George. I’m sorry to hear you haven’t been well! Wishing you a speedy recovery. Hope all is well at Tiger Canyons. I was shocked to read about your cancer. I too have cancer but refused to let it get to me. I live my life with determination to LIVE it, as I only have one life. I was diagnosed with cancer in 2006 and thank the good Lord that I am still alive and kicking 9 years later J.
I loved your article, Goddess Gaia, and the reality thereof. I wish you all of the very best with your health and trust you will be strong, healthy and able to beat the cancer so that you can continue your fabulous work at Tiger Canyons. These majestic animals need you. I wish you well sir. Thank you JV – great call. My family and I visited Tiger Canyons a few years ago....(picture attached) I'm the one with the flower! We were really happy to hear that you are cancer free. I would love to return to Tiger Canyons one day - the last visit was truly one of the most amazing experiences I have had. John, nothing more needs to be said. If that message is not received or acknowledged I pitty us silly humans. Hope your health is kind to you. In my religion we say ‘good may be with you and support you for a total recovery’. Inspiring email this a m! We all need to get our ducks in a row!! We pray for your complete recovery asap!! I was very shocked to hear of your current fight with cancer. My thoughts will be with you during this difficult time and i wish you all the best. I myself am also not a religious man at all but like you believe in Mother nature as a great force. She will eventually sort us all out one way or the other i believe. This human factor in the world has gone crazy and i fear it will only get worse before it gets better. I am so glad i had the opportunity to come and see you and your cats. What great work you are doing. John you have my hart and i am truly sorry to hear about your misfortune. I know you were a great friend to my dad and a truly big piece of his life. This has always stuck with me. You are a very special person and i hope you beat the hell out of this cancer. best wishes and good luck JV. If you need anything that i can help with in my small capacity, then please let me know. I have read your mail with great disappointment and sadness in my heart. Somehow I always thought that a man like you, doing such a great work in conserving God's creation would have a closeness to Him that some of us can only dream of - that you would know that your surviving the attack from Corbett was through the mercy of God - not luck - not some goddess that has her origin in Greek Mythology - not anything or anyone but GOD. It is through His greatness and His mercy that every thing on earth, and all of us, good and bad exists. It is by His Hand that all of it will some day be destroyed again - why - because we refuse Him His rightful place in our lives. Because the so called religious leaders of this earth, do not heed His call, will not obey His commands, will not nurture and respect what He has created and entrusted to us. It is by His mercy that you will survive the cancer in your body, that this great work your are doing will survive and flourish. It is to Him I have always prayed for the blessing and the mercy that is upon you and the work that you do. Your forefathers were answering the call of God our Creator. Please do not deny that heritage, the call of God for us to love honour and respect Him. Please do not be angry for writing you this letter. I always had such respect and admiration for you and the work you have dedicated your life to. With God as your leader, provider and Jesus Christ as your saviour you and the work you are doing, could be so much more. I just could not sit back and let you miss out on the greatest gift you can ever receive - life eternal. I will never stop praying for you - for your protection and your well being and that you will hear the call of God your Creator in your heart and in your mind - that you will obey it and that you may receive life eternal. If all of us who actually care about the earth and its creatures do a little then things would get better. You're doing your part. I try in my small way to do mine. The video states it perfectly. I had no idea about the cancer that JV is now dealing with....I am deeply saddened and sending blessings of strength and healing. Just to say that I am one of those who believes in the God who created the beautiful tiger, cheetah and all the rest. I also believe He hears prayer, and I want you to know that I have prayed for you at this time. I honour you for the wonderful work you do to preserve the beautiful creatures of our planet and I am praying that you may yet have many years to continue what you are doing!